This is the second controversy for Dolce And Gabbana this year. After receiving severe backlash for body shaming Lady Gaga earlier this year, Stefano Gabbana, co-founder of luxury fashion house Dolce & Gabbana, has found himself in hot waters yet again. This time, it's for a pair of sneakers from Dolce & Gabbana's Fall 2017 collection that equate beauty with thinness. Stefano took to Instagram to post a picture of the sneakers. The white leather sneakers are meant to represent the millennials and have phrases like "I Love Pizza Pasta," "Sorry But I Want More Of You," and "So Fab" scribbled over in addition to the controversial phrase in question - "I'm Thin & Gorgeous." No comments on the issue have been made by the designer or the design house yet. 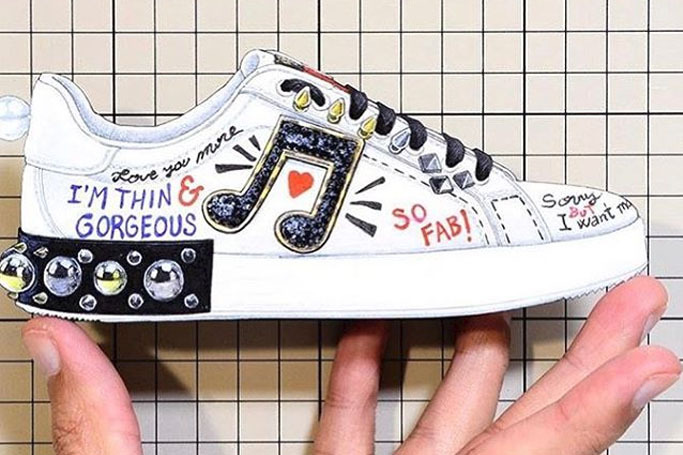 However, Claire Mysko, CEO of the National Eating Disorders Association, insists that there's a deeper issue with this Dolce & Gabbana design: "Though there may be an element of cheeky humor at play in the design of these sneakers, equating thinness and beauty with success and status is a message that hurts everyone," she told Yahoo Style.